Spirit possession is a familiar anthropological interest. But efforts to understand it through scholarly, secular thought often require some suspension of disbelief. Or, more disconcertingly, they simply avoid engaging with the phenomena on its own terms, looking to locate its source in social, cultural, political or psychological conditions — “anywhere but the body” (210). With this ethnography of spirit possession in a South Indian fishing village, Kalpana Ram makes tracks into a more empirically satisfying analysis. Ram grounds herself close to those women who have been possessed. She takes their experience as a straightforward fact, and in doing so, rattles the foundations of the thought systems that deny the logic of such an experience. What makes this approach so effective is that possession is not the book’s sole subject (though the stories of women given over to bitter or benign spirits animate its most poignant chapters); its subject is also the modern epistemologies that beleaguer attempts to make sense of spiritual phenomena. Ram dissects the key sources of this discontent, amongst them: the Cartesian privileging of minds over bodies; the scientific modelling of bodies as biological objects; and the Christian theological assumptions that are generalised into understandings of consciousness, will and agency. She also highlights ideological biases particular to an Indian context, like the obfuscation of Hinduism’s diversity to favour those branches seen to be on par with Western rationalist thought. Amidst these deconstructions, Ram forges productive, convincing theoretical directions, drawing most notably on phenomenological philosophy, post-colonial thought and feminist scholarship. The book swells with rich ethnography and emotional insight throughout. Helpfully, Fertile Disorder is arranged so that the reader’s journey mimics Ram’s own evolving comprehension of a puzzling phenomenon. In its first pages, as if from one layperson to another, spirit possession is introduced as an intrigue. Its inscrutability is put into check by the two chapters comprising Part I, which together describe the historical, classed, emancipatory and high-caste Hindu forces that collude upon poor rural people — particularly women — to deny the facticity of their embodied worlds and experiences. Some such forces are specific, like the family planning missions who treat poor women’s reproductive systems as tools that can (and must) be controlled by their bearer. Other, broader forces show their face in what makes some Indian traditions a rich legacy and others vestiges of backwardness. Ram makes the canny observation that elite Hindu orientations to tradition, like Ayurveda and yoga, are never suspected of backwardness. If anything, they represent a sustained dialogue with the past, imparting a sense of Indians carrying tradition’s finest features into modernity. This observation has reaching resonance. India’s most fruitful ideological exports proclaim that sheer will and discipline are, first of all, uniformly accessible, and secondly, are the bridge to health and happiness. These ideas underlie yoga and meditation and drive their steady global spread, from the spartan yoga studios in most cosmopolitan centers to more therapeutic contexts, like counseling and rehabilitation, where a peaceable Eastern emphasis on willpower can help catalyze new realities for troubled people. The upshot is that in places like the Kanyakumari region of Tamil Nadu, which is saturated with development projects, the powers of psychiatry, sociology, high-Hinduism and rationality all congeal in opposition to those everyday experiences dismissed as the superstitions of uneducated people. To demonstrate that these experiences do matter and may have meaning beyond their peripheral status, Ram relies on the strength of her informants’ life stories. She relays these in the four chapters of Part II such that the reader may trace her footsteps to the conclusions she draws. Some of the stories are deeply moving, as women recount past losses or suffer fresh ones, including miscarriage, death of loved ones or difficulties adjusting to marriage. Chapter four opens with a lament by an infertile woman who compares herself unfavorably to clay, stone and wood — these materials have a purpose: as pots, temple doors and statues. Barren, she deems herself purposeless. This link between sadness and corporeal vulnerability is persistent. Most women are possessed in emotionally, socially vulnerable times — times that simultaneously draw attention to emotions and redefine emotions. Ram develops this observation towards a theoretically potent formulation of relational agency and emotion; she suggests that those who are susceptible to possession share the capacity to be affected by the suffering and violent ends of others. “It is this capacity, unevenly distributed within any social group, that seems to allow ghosts to find particular individuals to serve as their witness, often in pitiable and dramatic ways” (88). The errant goddesses and ghosts who possess vulnerable women are also catalogued in these chapters. They are marked by class (there is a goddess whose name Ram remembers from family worships in her childhood — a serene figure in that middle-class context who manifests in the fishing village as a malicious, vengeful spirit). They are marked by gender too, and the ghosts can frequently be linked to past un-atoned, gendered injustices surrounding a woman’s death. Over these richly textured chapters the power of these spirits remains potent. Yet, it is de-exoticized. Like pregnancy, like driving a car, spirit mediumship is presented as the body’s acclimatisation to an object/subject one extends oneself through: “it entails developing a skilled form of comportment in relation to an initially unknown and unchosen being that seems to want to consume a great deal of one’s life” (154). Similarly, mediumship is shown to entail an agent’s conscious submission to a relative agent, much like Alfred Gell’s artist submits to the tree he or she wants to paint, in order to render it “by some mysterious muscular alchemy which is utterly opaque to introspection” (Gell 1998: 45, cited pp. 155). The objectivity of spirits may be folded into notions of traumatic memory, felt in distorted form when recollected (like Merleau Ponty’s phantom limb), and emotions may dog grieving widows like ghosts. These middle chapters of Fertile Disorder accumulate the sense of such permeable worlds. By the time I reached Part III, in which modern theory is reconsidered with fresh eyes, I felt pleasantly rearranged. Besides this book’s obvious contribution to the literature on South Asia, subaltern studies, embodiment and spirit possession, it also has something to offer studies of resistance, memory, grief, trauma and alternative forms of justice. The unique ways that Fertile Disorder furthers theories of agency and of habitus are also significant. More generally, though, Ram’s attitude in these pages makes me think of Trinh T. Minh-Ha’s eloquent distillation of ethnography’s placement and objective: to not speak about, but to speak nearby. [i] In a way, anthropologists are not unlike the mediums described in the book: entraining intellectual, embodied selves to the concerns of other agents — be they corporeal or spiritual — in order to speak of them with integrity. And so I would even suggest this as one of those monographs worth reading simply to enjoy ethnography done well. [i] In her film, Reassemblage (1983). Mythily Meher is a medical anthropologist doing her PhD at the University of Melbourne in Australia. Her research concerns engagements between diverse understandings of mental illness, with a focus on people’s efforts to reorient their own or others’ beliefs. 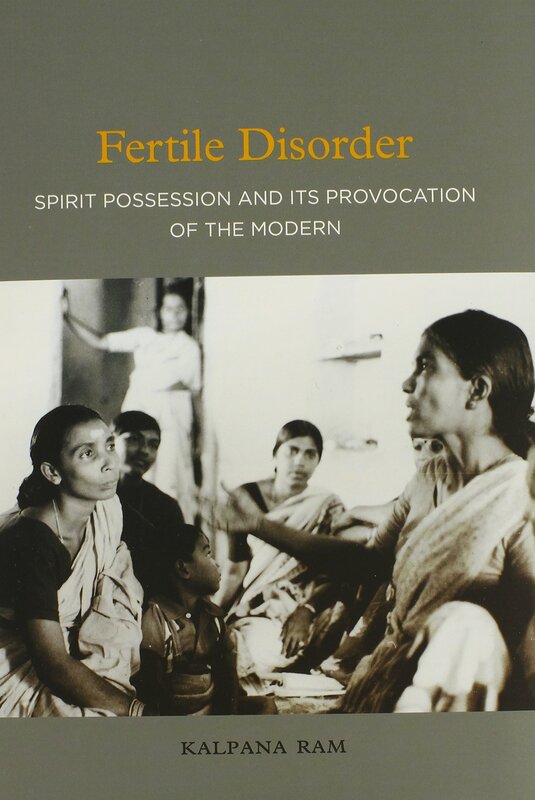 Meher M. Kalpana Ram’s “Fertile Disorder: Spirit Possession and its Provocation of the Modern”. Somatosphere. 2015. Available at: http://somatosphere.net/2015/kalpana-rams-fertile-disorder-spirit-possession-and-its-provocation-of-the-modern.html/. Accessed April 26, 2019. Meher, Mythily. 2015. Kalpana Ram’s “Fertile Disorder: Spirit Possession and its Provocation of the Modern”. Somatosphere. http://somatosphere.net/2015/kalpana-rams-fertile-disorder-spirit-possession-and-its-provocation-of-the-modern.html/ (accessed April 26, 2019). anthropologists are now training to speak of spiritual agents?